So, the first leg of the tour took us to the city of Lop Buri, according to the GPS, some 80-odd kilometres north of Ayutthaya. It’s funny (firstly, its funny how people say ‘its funny’ to describe things that really are not funny, things that are frustrating, annoying, disappointing…) but I think I chose to go to Lop Buri over Sing Buri because of something I read on one of the bike tour itineraries. The funny bit is they have a support vehicle. Funnier still, they must have gone there because there was something to see, but I could not remember what. Anyway, on the map, Lop Buri and Sing Buri are a similar distance from Ayutthaya. I booked the MDR Hotel; Lop Buri it was. Approximately an 87km away according to the GPS, 67km, according to hallowed Google Maps. 3. The traffic worried me. I fairly wobbled along on the bike, proud that I was carrying all my luggage. But I also felt vulnerable; a snail or a tortoise (I saw a fair few of the latter cracked open like water melons on the highways), bearing the full weight of my life and vulnerable to it being smashed to smithereens. 4. The owner of Luang Chumni Village worried me further. Watch out for the traffic, it is dangerous, she said. A British couple had both been killed, she reminded me, during a bike tour as a pick-up had ploughed into them, the driver’s attention distracted by something he wanted in the footwell. 5. Dogs, dogs, dogs, everywhere. Could I out-pace them, weighed down by the burden of my life? Or would I have to stand and fight? 6. Could I actually cycle long distances? A big question that should have come nearer the top of the list. I left on this wave of ‘what ifs’ and we made our way out of town through back streets, me increasing my chances of making my fears reality by brandishing and reading my iPhone as we went. Soon the town fell away to flat countryside and the odd wat. 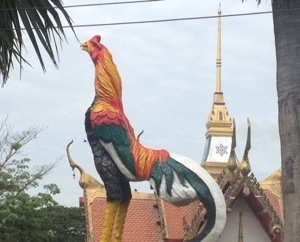 Already, wats had begun to wain for me (not least because of the packs of dogs that languished in the ruins in Ayutthaya), only the cockerel wat brought me up short. The day was flat, hot and we were chased by dogs. Mercifully, a Thai lady called them off. They have this bark (Thai women) that stops dogs in their tracks. 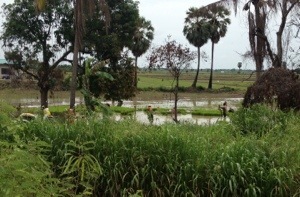 So, on we cycled, increased adrenaline helpful if anything, through ramshackle villages, proud, lonely wats and sparse green and brown paddy land where water birds lifted from the fields as if shaken from a blanket. Sorry, I missed the birds but managed to steal this image. At say 40km, I began to get hot. I had not put on my sunglasses, the sun was penetrating through the ridges of my helmet and the helmet itself had begun to make me feel like my swollen head was in a vice. Under sufferance I swapped the helmet for a baseball cap, put on the glasses and slugged warm water. On we went. We made it to the centre of Lop Buri unscathed (and refreshed following chocolate milk at the 7 Eleven), cycling goggle-eyed through a huge teak furniture market to a huge roundabout. But then we were lost. I had booked MDR Hotel as I had read that it was refurbished and of the scant choice of accommodation in Lop Buri, it looked the best. Furthermore, the dogs reared their scabby heads, because I was sure I had read somewhere about the presence of large packs in the old town, which was enough to convince me I was not staying there. As we make our way by bike from Central to Northern Thailand, breakfast is proving to be a big part of the day. From Lop Buri to Sing Buri, Sing Buri to Uthai Thani and onwards, we have stayed in hotels and guesthouses that serve us breakfast before our day on the road. The smaller places tend to serve an individual American Breakfast (the assumption is made that that is what we want and if I don’t I am at least going to have to do away with my baseball cap!) but the larger ones are buffet style. A buffet can be looked at as an invitation or a challenge and is great if you want to pack in the calories. I am good at the calorie packing, but most mornings I also meet a huge amount of choice and an equal helping of anxiety. How much is it socially acceptable to eat? Is it really ‘all you can eat’? Personally, when no-one is looking (I do like a poorly staffed buffet) I have at least three courses. Thai food, followed by a couple of fried eggs and toast, followed by fruit, with two or three helpings of juice and two coffees is normal. However, I am not sure if it is ‘socially okay’. What should you eat your food in and with what? What is it acceptable to eat? Obviously, if you face an array of Western food you know the answer to that. But in Thailand, where breakfast is the same as lunch or dinner, the array of choice is at times disturbing and the combinations endless. What do you do when the staff say something to you that you don’t understand? Smile politely and cluelessly? Yes, but they probably just told you that having those things together on your plate is disgusting and could you please leave some food for the rest of the guests. But what choice do you have? The only choice I see is to become horrendously spooked. There was the soy-milk man in Nakon Sawan and then there was the omelette man in Khampaeng Phet, where as I perused the large buffet at the Navarat Heritage Hotel and my anxious eyes fell as usual to the tin of fried eggs, a distinguished looking, Thai chef approached me. The fear hit immediately and a thousand thoughts fired at once, meaning I was not able to understand that he was asking if I wanted a freshly made omelette. Instead, I fought to grasp my understanding from the paranoid thoughts in my skull. Was he saying I was not allowed a fried egg? Perhaps that my reputation had been sent on ahead, he knew my game and I was to leave some of the fried eggs for the other guests? All I could do was stare with open mouth and gesture at the shiny white and yellow food. Eventually, he got a message (not the message) and walked away. When I sat down Nick suggested that the Chef might have been the more traumatised by the event than I. I have since avoided all omelette chefs, for their sake as much as mine. 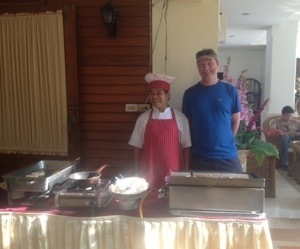 Nick posing with the chef from Phoom Garden, Phrae (done mainly to wind me up). However, with my chicken curry breakfast (with personally applied garnish of parsley, onion, noodles and crispy fried things) still making its way through my tummy I can honestly say that the breakfasts in Thailand are an absolute treat. The only advice I would give, to me as much as anyone else, is smile and tuck in! Who cares if you just put yoghurt on your sausages? Phoom Thai Garden Hotel, Phrae – they have an omelette woman and a lingering chef who scared me out of my wits this morning as he suggested I eat his chicken curry, but for variety, the option of outside dining and indeed the immense chicken curry, they come top of the breakfast podium. Polite note: the coffee is so thick it might give you a coronary having blocked your arteries with sludge. However, the staff are very friendly so should this happen they will be sure to do all they can. Thai Thai Sukhothai, Sukhothai – a surprisingly varied and delicious breakfast. It was a surprise because despite the guesthouse’s exceedingly positive reviews on Trip Advisor, reviewers were less than positive about the breakfast. Perhaps they are responding to criticism, because it is served in a spacious, covered restaurant and the food was good and varied and included real coffee and milk. Navarat Heritage Hotel, Khampaeng Phet – trauma aside, there was a huge amount to chose from. My only regret is that I did not get to try an omelette.